Unsure about Volumes of Solids of Revolution? A sound understanding of Volumes of Solids of Revolution is essential to ensure exam success. 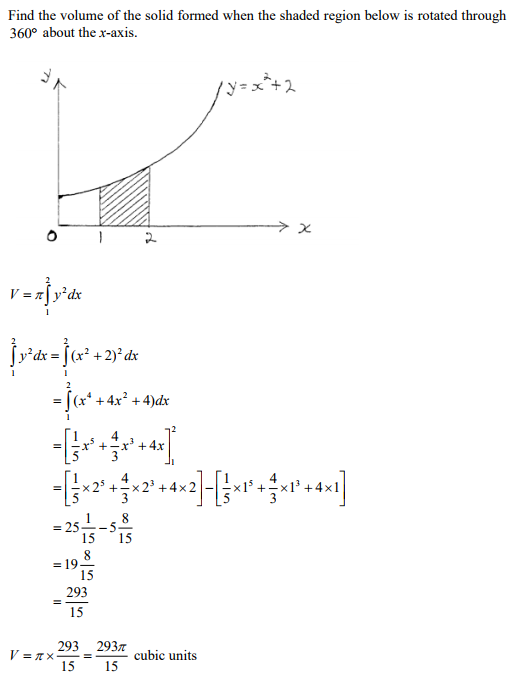 When a region in the x,y-plane is rotated through 360° about the x-axis, a solid of revolution is formed. For example, when the shaded triangle below is rotated through 360° about the x-axis, a cone is formed. Consider the two diagrams below. If the area enclosed by the curve and the x-axis (between x = a and x = b) is rotated about the x-axis then the solid of revolution is formed. It can be shown that the volume of the solid of revolution formed above can be calculated using. Through step-by-step worked solutions to exam questions available in the Online Study Pack we cover everything you need to know about Volumes of Solids of Revolution to pass your final exam. Subscribing to the Online Study Pack may therefore be one of your best ever investments. Please click Online Study Pack to view screenshots, examples and instructions how to subscribe.